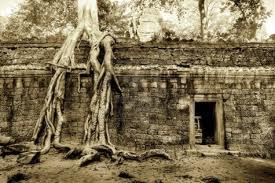 We found a strangler fig growing in a corner of the bathroom, in a tiny space between the wall tiles and the frosted glass sun-roof. From down in the shower stall it looked like one tiny leaf. When we got the ladder and climbed up to check we found a full grown plant with 6 leaves and roots 3 inches long. Over a period of a hundred years or so, this is what might happen! I’m reminded of the strength of nature, unleashed and unchecked. I’m reminded of what happens when the lid is lifted on human frailty and we allow our natural wild emotions free reign. And I think about Myanmar, the seemingly peaceful country full of hope I visited 2 weeks ago. For the last 3 days the papers have been full of news about the rioting between Muslims and Buddhists in that country. The military is talking about “restoring discipline”, “maintaining harmony”. You see, I can already hear the cynics saying, this is what happens when you let the mob have its freedoms. But there’s another green blade rising today, Easter. It’s a blade that springs forth after three days buried in the ground. There’s a green-ness to it, signifying a new and everlasting life. There’s a sharpness to it, to remind us it’s a blade that can cut us free from our un-redeemed human nature and take us somewhere better. It’s a blade of hope, reminding us that despite ourselves, we’re redeemed. May we celebrate the life given us by the leaping green blade of resurrection. A beautiful Easter blessing. I have always heard that song in the context of Christmas, but I realize it is really a song about resurrection more than it is about birth. Yes Kathleen, sometimes they sing it for Christmas. But the words are really about Easter aren’t they? Blessings to you for a joyous Easter. Beautiful post!